NVivo does not prescribe an approach but provides the tools to let you work the way that suits you best. For example, if you have many files or you have large dataset files—make the most of NVivo's auto coding and query-based coding features. If you have a smaller number of files that require close analysis—take advantage of the easy-to-use coding techniques. Select and code content using the options in the Coding group on the menu. Right-click to access options on the shortcut menu. Quick code using nicknames for common nodes—for example desalination could have the nickname desal. You select the content you want to code and enter or select the nickname. Each page of the PDF is also coded as region (image). For example, a two page PDF (which contains text) will be coded as three separate coding references—one for the text, and one for each page. If the dataset contains file shortcuts, the content of the destination file is also coded entire to the node. 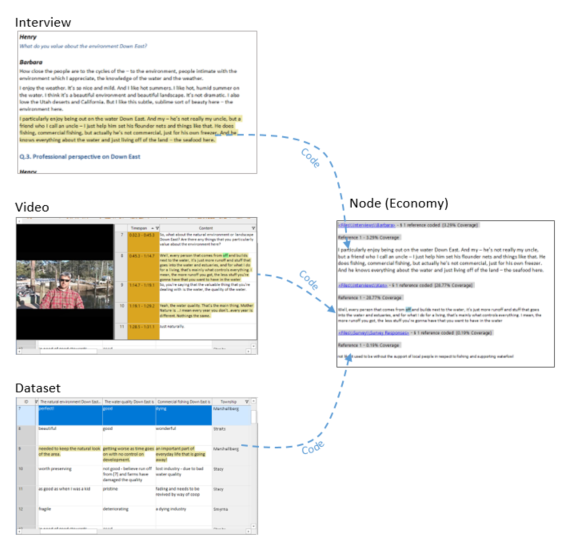 If you are working with structured content, auto coding provides a fast way to organize it into nodes—for example, if you have interviews that contain the same questions (and are consistently structured), you can gather the answers to each question in a node. Custom field (columns) in audio or video transcripts For example, if you have added the custom field Speaker, NVivo can create a node for each speaker and code the content at the node. Ranges Where your files are already structured by theme or topic you may want to use range coding. For example, code paragraphs 1-5 at the node conservation or transcript rows 2-4 at the node sanctuary. Range coding also supports paper-based coding—for example, you can print out a document with the paragraph numbers displayed, mark up the text to code and then range code in NVivo. Pattern-based auto coding is an experimental feature that you can test and try out. This feature is designed to speed up the coding process for large volumes of textual content. When you auto code using existing patterns, NVivo compares each text passage—for example, sentence or paragraph—to the content already coded to existing nodes. If the content of the text passage is similar in wording to content already coded to a node, then the text passage will be coded to that node. If you are working with large volumes of data, or have limited time, you can quickly identify broad themes and sentiment in your files using the Auto Code Wizard. This process uses a different engine to pattern-based coding—it uses linguistic processes and a specialized sentiment dictionary to produce results. Display coding stripes for users—open a file and see the coding done by each researcher.